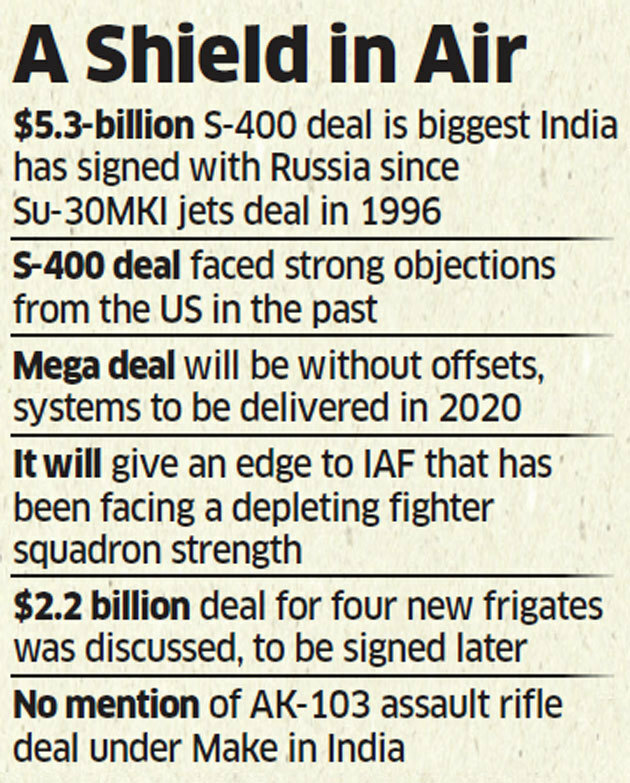 New Delhi: India and Russia signed their biggest defence deal in over two decades for S-400 long-range, surface-to-air missile systems but they have to deal with the challenge of transferring the $5.43 billion for the contract in the face of financial sanctions by the US. The long-pending deal, which was formally announced in a joint statement after a meeting between Prime Minister Narendra Modi and Russian President Vladimir Putin in New Delhi on Friday, will equip India with five regiments of the cuttingedge system that will strengthen air defences in the face of the air force’s depleting fighter squadrons. The S-400 regiments will be delivered starting 2020 and are likely to be deployed to cover both the Pakistani and Chinese borders. Beijing incidentally has already taken delivery of the systems that are considered to be the biggest threat to western-origin combat aircraft. While the deal was pushed through after hectic consultations at the top level, India will face the challenge of transferring money to Moscow for the deal. Typically, within days of signing a contract, a 15% advance is given to the foreign supplier to initiate production. In the case of the S-400, its manufacturer Almaz-Antey is on a US financial sanctions list that prohibits banking institutions from dealing with it, at the penalty of exclusion from the dollar trade controlled by Washington. While India has got exemptions from the US Countering America’s Adversaries through Sanctions Act (CAATSA), financial sanctions that prevent money to be transferred for weapons purchases from Russia are still in effect. This will make it difficult to find banking entities in both nations willing to risk processing the payments. In fact, even payments for ongoing projects with Russia have been stalled this year. Talks on the S-400 deal had started before CAATSA, said people with knowledge of the matter. “We have done what we had to do in national interests,” said one of them. The US Embassy in New Delhi was noncommittal on India getting a waiver for the S-400 deal. CAATSA was aimed at imposing costs on Russia for its “malign behaviour” and it was “not intended to impose damage to the military capabilities of our allies or partners,” a US Embassy spokesperson said. “The waiver authority is not for a blanket waiver. It is transaction-specific. There are strict criteria for considering a waiver. Waivers of CAATSA section 231will be considered on a transaction-by-transaction basis. We cannot prejudge any sanctions decisions,” the spokesperson said. The Russian system — being bought under special waivers from the Indian offset policy, given its cutting-edge technology—is considered a game changer as it can effectively paralyse enemy aircraft from operating even close to the border. As reported by ET, the high cost of the S-400 prompted a rare intervention in 2016 by then defence minister Manohar Parrikar to alter India’s air defence plans. The exercise showed that the acquisition would save the taxpayer Rs 49,300 crore in a 15-year period as other, lower-range systems would not be required. A technical study by the air force and an evaluation of all available air defence systems in the world cut down the long-term acquisition plan for over 100 each of medium and short-range systems in favour of the S-400. The study also determined that on a per-square km covered basis, it was the cheapest of known systems available globally. India is believed to have negotiated down the cost of the S-400 purchases by almost $1 billion during negotiations with Russia over the past two years. On other deals, there has been disappointment that the $2.2 billion plan to acquire four new advanced Krivak class frigates could not be finalised at the summit. Sources told ET that the acquisition was discussed at the top level and a deal will be signed at a later date. An inter-governmental agreement to manufacture AK-103 assault rifles in India also did not come through with sources saying that a few more rounds of talks were needed to finalise finer technical details.